How To Photograph Hindu Deities : The Picture Show Manjari Sharma uses elaborate sets, props, costumes and makeup to make her photos look like paintings. It's fairly common practice for painters to imitate photographs. There's even a term for it: Photorealism. But you don't see the inverse as often — that is, people trying to make photos look like paintings. That's what Manjari Sharma is attempting. 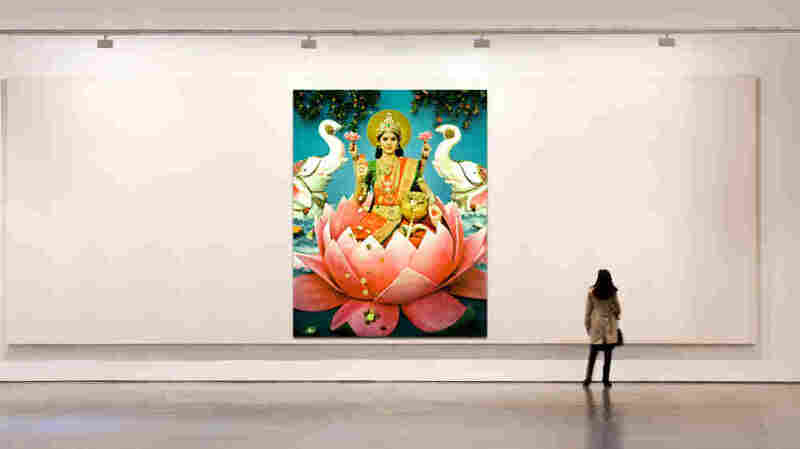 The goal of her new project, called "Darshan," is to photographically recreate nine classical images of Hindu gods and goddesses. And that's no easy feat. Maa laxmi, says photographer Manjari Sharma, is the Hindu goddess of wealth and fortune, is a photograph in the series Darshan, a sanskrit word meaning "sight, vision or view." On a Kickstarter page, where she is campaigning for financial support to continue the project, Sharma explains the motivation behind her elaborate process. "Growing up in India," she says in the campaign video, "I saw spiritual paintings and sculptures of deities everywhere ... but never a photograph. ... My mission is to prove that a carefully created photograph can evoke a similar spiritual response." Sharma peers through her large-format camera on set. Sharma plans to build every detail of each photograph by hand. 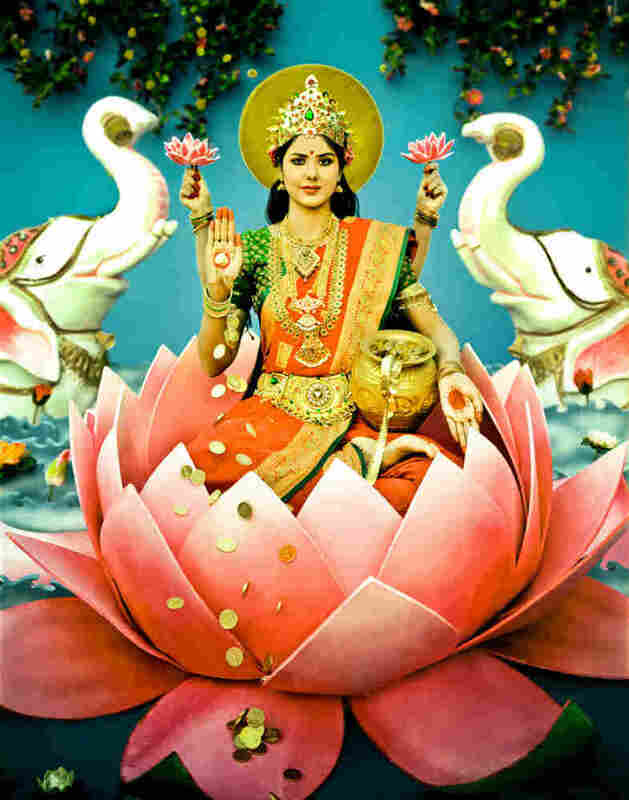 The first image, and the only complete one, is of Maa Laxmi, the Hindu goddess of wealth and fortune. It involved set and prop builders, makeup artists, painters, carpenters and jewelry experts. And when everything was finally in place, Sharma captured the scene with a large-format film camera. She responded to a few questions over email. Each detail of each photo is hand-crafted. 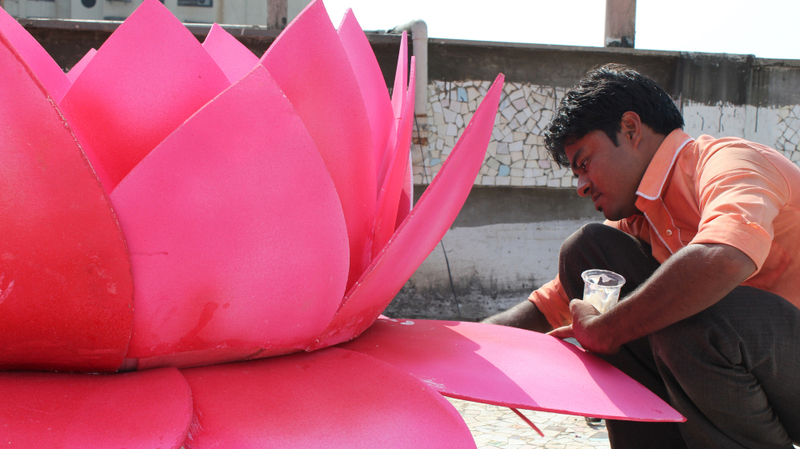 The Picture Show: You moved from India to the U.S. to pursue an Master's in Fine Arts. Could you describe a bit what that transition was like? Being expected to be self-aware and self-direct are attributes that independence comes with, but in the U.S. the liability of that independence somehow seems greater. I think it's because the community in India is so tightly knit, that when you newly arrive in the U.S., the first thing you learn is about your own space. So at spiritual level, I would say being confronted with that self-study really helps you define to yourself more concretely than ever — who you are. Why make the photos so painterly? One of my many motivations to have my image look like a painting is to have viewer do a double-take on what exactly he/she are looking at. ... A viewer may recognize the familiar colors and draw from their own sense of nostalgia, but there is something different about it. You can't necessarily place your finger on what it is. "I see Darshan displayed as an installation of 6-feet-tall prints," she writes. "An exhibit will be designed to evoke the experience of a Hindu temple." Can you provide some background on the aesthetic of Hindu iconography? Each deity has their own rich and fantastical stories which carry important moral lessons. Every god or goddess is worshipped with the use of certain specific objects. Conch shells, fabric, jewelry, figures, postures and emotions of anger, glee or compassion are also employed in accuracy and accordance to the scriptures. 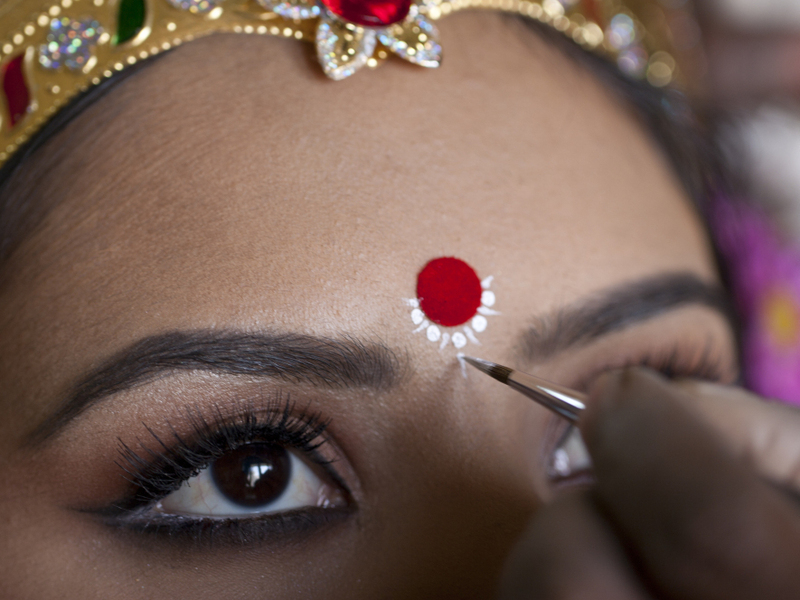 A make-up artist studied and painted the features of Maa Laxmi's eyes and ornamental touches. The myriad details and layers are what make the Indian deities bear such color and grandeur. The Hindu process of prayer is a multi-sensory experience. The deities are decorated with garlands of flowers, sandalwood paste smeared across their foreheads. They are bejeweled and placed of appropriate thrones or in the water or clouds on certain animals of choice which bear significance to their mythological roots. Giving offerings is part of worship, water or milk, waving incense smoke, or placing food items like fruit or sweets on the altar. What about the use of film? Shooting it on film ... raised the bar on chasing perfection in one image, which certainly raised the bar on everyone's performance. The final selection of the right shot greatly depended on the expression of Maa Laxmi, for which much coaching had been given to me — and through me to Sonam, who is the character playing Maa Laxmi. Maa's face has to display Karuna, which means compassion, and Sonam had to learn how display compassion rolled into grace.